Jonas, the son of unhappily wedded Ethiopian immigrants, has learned how to cope with life by to lying to himself and others. But after his marriage plummets and he’s fired from another job, Jonas decides he needs a change in scenery. He begins to trace the same route his parents took on their unhappy honeymoon: from Jonas’s hometown in Peoria, Illinois, they traveled toward Nashville, Tennessee—the home of country music. In the meantime, the collapse of Jonas’s relationship, which occurred several months before his trip, is rehashed in great detail. As he recounts the major events in his adult life—meeting Angela, a summer intern right out of law school, at the immigration center where he worked; beginning a life with her; teaching English when he is laid off at the immigration center; ending both his failed relationship with Angela and his failed career as a teacher; and leaving New York City—one begins to see that Jonas has been a passive participant in his own life. He allows circumstances and others to blow him in any direction. It was better, she believed, not to translate emotions into actions, to let them lie dormant, because once they were expressed, there was no drawing them back. They enter the world and having done so become greater than us. Jonas decides to take control of his life, and this trip is the first thing that he does for himself. He is finally able to see what kind of man he is, and in doing so begins the long road to change. It is difficult to review this book because it was difficult to read it. The story is slow moving, overwhelmed with exhaustive details of unimportant scenes, and weighed down with clumsy, unconvincing dialogue. In lieu of any real sort of plot, the characters must carry the story, but they are too bland to be of much interest. In fact, there was no one in the story with whom I felt any connection. The idea of viewing a couple’s failed relationship through the eyes of their troubled son is an interesting one, but Jonas is a dispassionate narrator and a lifeless character. Throughout the story, he attracted neither my sympathy nor my ire; when the lies with which he has constructed his life begin to crumble, I felt only a vague “told you so” feeling. I’m all for well-rounded characterization taking prominence over plot—hey, most of the action in Crime and Punishment takes place in the beginning, and you are sucked into the story not by his crime but by Raskalnikov’s inner turmoil and the way in which he interacts with other members of society. Good characters can be fascinating—when done well. But reading about Jonas’s inner thoughts and motivations was about as interesting as clipping Tinker’s toenails. The climax of the book—the events that made his parents’ marriage take a definitive turn for the worse, and the unveiling of how Jonas’s own marriage came to be so miserable—is disappointing. For Angela each loss posed as the commencement of a greater disaster that she had always imagined would someday occur, one that she believed wouldn’t end until she had been stripped bare of all that she had accomplished. Angela is powerfully motivated to succeed by her fear of becoming like her parents, but this fear is ultimately what drives her from happiness. I liked the narrator’s version of his father’s journey from Ethiopia better than anything else in the book; the crisp narrative style, lively descriptions, and exciting climax kept me reading eagerly. If only the book were about that! I found it interesting to read a story about Sudanese stowaways—especially after having just finished Zeitoun, who affirms that every time his ship left a harbor in Sudan, there was always a stowaway or two. 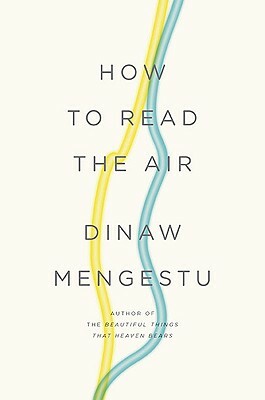 How to Read the Air is about failed relationships and imperfect people, and about the lasting effect of relationships on identities—for better or worse. Unfortunately, between the slow plot and the flat characterization, there was very little to draw me into this story, and even less to keep me hanging on. As a big fan of Mengestu’s first book, The Beautiful Things That Heaven Bears, I was disappointed in this, his sophomore offering.